← How organised are you? I was thinking about my Dad today. Funny how little things trigger a memory. I was watering my newly planted tomato plants. Water is precious as I have to bucket and carry from a tank I use for the garden. I grabbed an old coffee cup and counted out 3 cups for each plant and I was suddenly taken back to our vege garden when I was a child of perhaps seven years. Dad was beside me in old shorts and a white singlet. He was brown as brown can be with his Lebanese and Croatian roots making the singlet look even whiter. I too was as brown as a berry having got those same genes in abundance. We counted out the cups. 1,2,3 cups for each plant. Tip carefully so as not to wash the fresh soil off the roots where it hasn’t had time to even take hold of the soil. I stopped and stood up as the memory washed over me. I thought of the large tasty tomatoes that came from that garden and could see Dad carefully slicing them onto buttered bread, salt and peppered before devouring. His Father also had a beautiful garden and I used to love going out and surveying what was growing with him. That I ended up with Grandpas spade was fortuitous I think. I was destined to enjoy growing just as they did. I started to imagine if Dad were here now how I’d show him my tomatoes and strawberries, red shots of colour, healthy broccoli with orange nasturtium rambling through, bringing the bees in and keeping the butterfly off my plants. Id explain how Im using companion planting and worm tea. He’d be amazed! I’d love for him to have met each of our children as they were born. I’d watch them in the garden with him, and now they have children of their own, he’d be an old man delighting in their chatter. But that wasn’t to be with Dad’s passing at just 49 years, before I was barely an adult and him still young. How lucky I was to have spent that precious time in the garden and to have these special memories. One day at a time guys…and make the most of every single one! 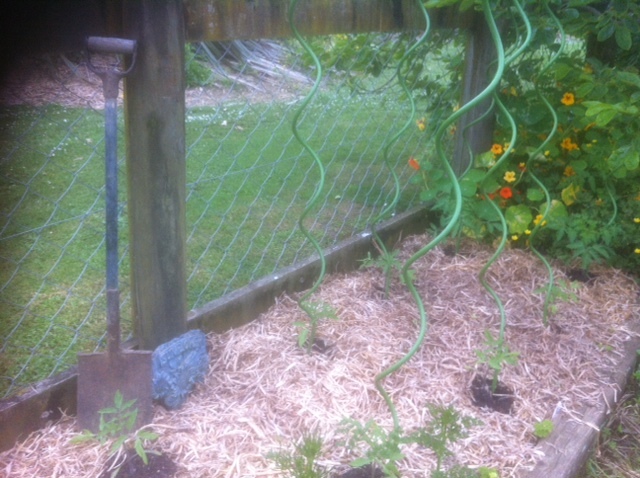 Aside | This entry was posted in Uncategorized and tagged growing tomatoes, making the most of each day, worm tea. Bookmark the permalink.